Over the years, I have known some dirty cops. I’ve known some sadistic cops. I’ve even known some outright evil cops. What’s rarely mentioned however is that I’ve also known an equal number of honest, hardworking and dedicated cops who truly wanted to serve the communities in which they lived and worked. I’ve actually interfaced with a lot of cops, and surprisingly – I don’t hate them. In fact, on balance, I’d say I generally like cops. Since we launched this site in March of 2011, I’ve sought to give voice to the Law Enforcement side of the issue of Deaf arrest and incarceration. I’ve attempted to contact police and corrections officers. I’ve pled for people to come forward and give us their point of view. I’ve contacted prisons and county jails. I’ve talked to retired and former guards. I’ve even written to a former cop, who’s now a blogger. In his defense, he did get back to me, but said he had no experience to share. Through all this, I’ve learned one hard lesson. Cops really don’t want to talk about being cops. I have been unable to find a single law enforcement or corrections officer who wants to step forward and be interviewed, or write an editorial piece for the site. The other day, after going rounds with my trainer – we were working on feinting to a body shot, and following through with an uppercut – I made my usual Dunkin Donuts stop. I’m sure none will be surprised to discover that there were cops in there. So there I am, sweat dripping from my soaked through Under Armour gear, and I decide – out of desperation at this point – to walk up and just ask ‘em. It’s at this point that I see the Tasers coming out, and that look cops get when they think you’re a couple of tacos short of a combination plate. So, I decide to explain. Well, here’s where the jokes start. I’ll skip them here, because I’m sure you can imagine them, but the upshot was – I was politely asked to move along. I don’t understand this. We never intended this to be a slam site. Sure, we seek to raise awareness on a tragic issue and perhaps in some small way effect change, but we’re trying to be open and fair. I would imagine that the line of officers wanting to plead their case would extend around the block. It should look like the opening night of a Jaws remake, but all in blue. It doesn’t. So once again, I’ll turn it over to you – our readers, supporters and contributors. If any of you know a police or corrections officer who wants to be afforded the opportunity to tell this story from their point of view, please tell them to contact us. There are numerous ways to access us through this site. Just the same, here’s an embedded mailto link. Tell them that we promise to be fair and open-minded. We’re here to learn and to foster change, not to build walls and alienate the very people who can help us the most. 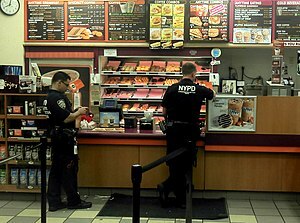 Posted in Editorials.Tagged BitcoDavid, Deaf Culture, Deaf in Prison, DeafInPrison.com, Dunkin Donuts, Law Enforcement, Police, postaday, Prison officer, Taser. Huge problem. A police officer or prison guard can’t really discuss what they do on the job without getting in BIG trouble. NO cop wants to lose his job. No one wants to let down his brothers and sisters in the “thin blue line.” Cops are used to being misquoted all the time and they don’t trust journalists or writers – and often with very good reason. If you know retired cops you may do better in getting feedback. Realize, they’re concerned that they’re going to get a stiletto in the back. As always, Marsha – astute advice. I’ll look into finding a retiree. Thank you.